BOSTON — Cedi Osman, making just the second start of his career, anticipated the pass, snatched hold of the ball and darted down the Boston Celtics‘ parquet court for an uncontested, two-handed slam. Only he missed the dunk, and badly. The ball caromed off the back rim and flew across the court, landing out of bounds. That was about the only thing that went wrong for the new-look Cleveland Cavaliers as they marched into Boston and controlled the Celtics on both sides of the ball, winning 121-99 on Sunday. While Boston welcomed former Celtics into the building for Paul Pierce’s jersey retirement ceremony — Kevin Garnett, Rajon Rondo, Doc Rivers and Antoine Walker were notable attendees — it was the Cavs’ fresh four of Rodney Hood, George Hill, Larry Nance Jr. and Jordan Clarkson breathing new life into Cleveland. Hill started at point guard, scoring 12 points and looking capable while defending Boston’s pick-and-rolls. Clarkson (17 points) and Hood (15 points) provided a punch off the bench, combining to hit six 3-pointers. Nance’s numbers might not have showed it, but his energy played a role in the Cavs’ defense holding the Celtics to just 40.4 percent from the floor. Just like last season, when the Celtics sailed through the 82-game slate atop the Eastern Conference standings while the Cavs seemingly stumbled along only to come into TD Garden late in the season and dominate Boston, Sunday was a clinic run by the Cavs. 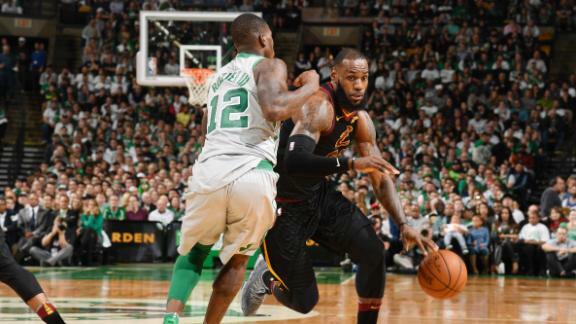 LeBron James barely missed his third straight triple-double, finishing with 24 points, 10 assists and 8 rebounds in 28 minutes, playing through an injury scare in the first quarter when he banged knees with Boston big man Aron Baynes. JR Smith continued his strong play of late and rewarded Tyronn Lue’s faith in him, keeping him in the starting lineup, by going 6-for-7 from the field — including a turn-back-the-clock drive and dunk on Baynes in the first quarter. And all of this after being together for only one practice, in Atlanta on Saturday. The Cavs have now won two straight games on national television after dropping their previous eight national TV contests in a row. They’ll have another national TV game Tuesday against the Oklahoma City Thunder before heading into the All-Star break. There might not be much time to get things right before the playoffs, but the first steps have been overwhelmingly positive.